We offer Dough Rounder Machine that rounds and kneads the pre-cut pieces of dough into perfect round balls of uniform size. The dough divider rounder is high in performance, low in maintenance and is easy to install and operate. We are backed by hi-tech manufacturing facilities and custom design our equipment on the parameters of capacity. Our range of commercial dough rounder is used in various bakery units. 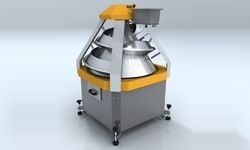 Both conical & umbrella type Dough Rounders Machineare available for perfect dough rounding. These rounder machines form the dough into balls with perfect rounding and uniform size. Wide range capacity available as per customer requirement.